As Robyn Arianrhod shows in this new biography, the most complete to date, Thomas Harriot was a pioneer in both the figurative and literal sense. Navigational adviser and loyal friend to Sir Walter Ralegh, Harriot--whose life was almost exactly contemporaneous to Shakespeare's--took part in the first expedition to colonize Virginia in 1585. Not only was he responsible for getting Ralegh's ships safely to harbor in the New World, he was also the first European to acquire a working knowledge of an indigenous language from what is today the US, and to record in detail the local people's way of life. In addition to his groundbreaking navigational, linguistic, and ethnological work, Harriot was the first to use a telescope to map the moon's surface, and, independently of Galileo, recorded the behavior of sunspots and discovered the law of free fall. He preceded Newton in his discovery of the properties of the prism and the nature of the rainbow, to name just two more of his unsung "firsts." Indeed many have argued that Harriot was the best mathematician of his age, and one of the finest experimental scientists of all time. Yet he has remained an elusive figure. He had no close family to pass down records, and few of his letters survive. Most importantly, he never published his scientific discoveries, and not long after his death in 1621 had all but been forgotten. In recent decades, many scholars have been intent on restoring Harriot to his rightful place in scientific history, but Arianrhod's biography is the first to pull him fully into the limelight. She has done it the only way it can be done: through his science. Using Harriot's re-discovered manuscripts, Arianrhod illuminates the full extent of his scientific and cultural achievements, expertly guiding us through what makes them original and important, and the story behind them. Harriot's papers provide unique insight into the scientific process itself. Though his thinking depended on a more natural, intuitive approach than those who followed him, and who achieved the lasting fame that escaped him, Harriot helped lay the foundations of what in Newton's time would become modern physics. 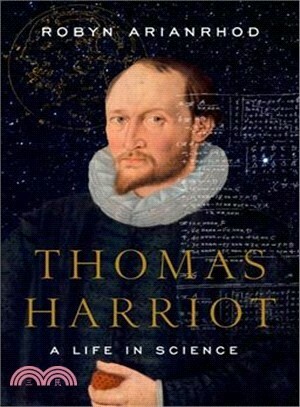 Thomas Harriot: A Life in Science puts a human face to scientific inquiry in the Elizabethan and Jacobean worlds, and at long last gives proper due to the life and times of one of history's most remarkable minds. Robyn Arianrhod is Adjunct Research Fellow at the School of Mathematical Sciences at Monash University. Her previous works include Seduced by Logic and Einstein's Heroes.